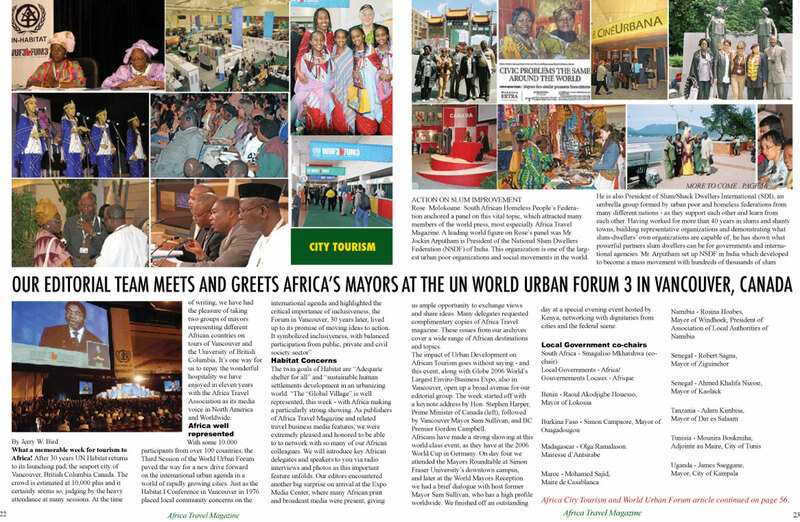 Great Cities of Africa Magazine Series Born at UN World Urban Forum, Vancouver . By Jerry W. Bird. Africa Travel Magazine's "Great Cities of Africa" series debuts soon . Each city edition will be updated annually in print. Travel, Trade, Tourism and Transport are four keys to Africa Travel Magazine's " Great Cities of Africa" series. Bonus items include radio profiles, audio tours, lectures and DVD. Africa's Green Revolution Impacts Every City and Village. Over 30 African cities have hosted ATA World Congresses and Symposia, representing 22 member countries. While we focus on the North American Market, African Tourism Ministers serve as President and Directors, along with members from airlines, airports, hotels, tour operations, media and education. We are familiar with Africa's emerging cities since our members have covered the continent since 1975. But we ask for your help as well. Be an Ambassador for your favorite city - send contact names, items or articles to africa@dowco.com, or fax (604) 681 6595. "I am Abuja, federal capital of Nigeria since 1991. I am located in the heart of Africa's most populous country, and confident about my future as a world center and magnet for cultural, adventure, educational and leisure tourism in the magical lands of Nigeria beyond my borders. My broad, well maintained paved streets, attractively landscaped boulevards and modern overpasses keep the traffic flowing at a smooth pace, morning, noon and night - and with wide cinemascopic vistas in every direction, there's no feeling of being hemmed in by gridlock. Being in the Nigerian heartland, I am adjacent to the states of Kogi, Niger, Kaduna and Nassarawa. During Carnival week festivities in late November, visitors will see the culture of all 36 states on display in rhythmic, pulsating music, durbars on horseback, camels from the far Sahara, and exotic tribal dances. It's an unending kaleidoscope of colorful regalia, fun activities, parade floats, tribal masks and costumes unique to the various states. Born in 1976, I am considered a model city for all of Africa, and one of the world's handful of totally planned cities. I am Calabar, an historic seaport city and former slave trading post, strategically located on the Atlantic Coast near the Cameroon border. I am capital of Nigeria's Cross River State and considered the future superstar of West African tourism. That bright, shiny future is just around the corner according to the Governor's active timetable. In terms of economic potential, I am located near Port Harcourt, heart of Nigeria's petroleum industry, a magnet for business travelers from all corners of the world. What about my mission for the new millennium? I was selected host city for the Africa Travel Association's 10th Cultural and Ecotourism Symposium, a prestige event that attracts tourism industry executives from North America and the world. What was the key factor for this decision? Mombasa: Magical Sands, Sparkling Sea. Addis Ababa, Ethiopia: Host city for the ATA 32nd World Congress in May 2007. Focus on Ethiopia's Millennium activities, attractions and tours. Dar es Salaam, Tanzania: From its early history to its position as a major port. Edition includes Zanzibar across the bay from Dar es Salaam, voted one of the world's top island vacation areas. Profiles of new luxury hotels that are making this area one of Africa's hot spots for business and tourism. Two cities that hosted ATA events, with hundreds of outstanding photos. This edition includes the remarkable developments in Cross River State and the cultural highlights of Abuja's Carnival. Kampala, Uganda: The green city of seven hills, Kampala hosts the Commonwealth Heads of State.